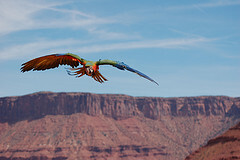 When you first hear the term, “freeflight parrot” you might expect to see a parrot flying through hoops in bird show at a theme park, or perhaps doing some stunt in a washed up Vegas showroom in a dingy hotel located in the wrong part of town, just north of the famous strip. Very few people are fully aware of the “no-limits” potential of what I refer to as, Freestyle Flying™. Imagine for a moment what it would be like, if you took your clipped parrot outside, let go of his feet and a 25 mph wind gust took him out of your hands never to see him again. For many, that is unfortunately a very common story. Now imagine going to some exotic location after 90 days of formal training and intentionally letting go of your parrot. 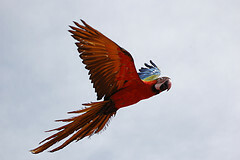 Nothing beats the rush of a gust of wind taking your parrot 50 feet up into the air, as you watch that bird maneuver on an invisible wave of wind, as if he were a surfer riding on the great waves of Hawaii. He skillfully hovers in one spot until he gets enough confidence to surf the air and coast back and forth, only to land on your hand a couple of minutes later. Freestyle Flying™ isn’t for everyone, but it is for every bird. And if you’re the kind of person who is willing to put in a lot of time, energy, and research, this can be the best quality of life that you can offer your parrot. Over the past year I have been fortunate enough to fly my flock at locations all across the U.S., and watch as they go from freshly weaned baby parrots, to fully skilled pro’s. To make a quick, evasive turn) As your parrots become more and more confident and skilled, they’ll start to experiment with evasive maneuvers that they use in the wild to evade predators such as hawks and eagles. They’ll actually flip upside down, flap, turn right side up, upside down, etc until they have successfully evaded the predator. Although I have seen this used twice to actually evade a hawk (or flock of seagulls), they also love just practicing it on their own. If you ever have the opportunity to experience the freedom of flight, through Freestyle Flying™, make sure that you don’t miss out on the opportunity. Freeflying your birds is just the greatist and must exciting thing that you can do with your bird. 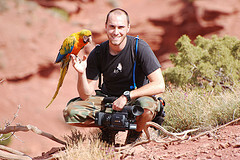 I had the great luck to meet Dave and get into his program with one bird and now I have a 2nd one. Both of them just look forward to be able to go out and fly free. It is amazing to see how happy they are and that they just love being able to do it. As Dave says it is a lot hard work in the beginning teaching the bird as a baby, but the rewards are well worth it for you and your bird. I will say thou this is not something that you just do on a whim you need someone wo knows what they are doing to train you. Many thanks to Dave I have 2 really happy birds that love doing what they really bred to do!